In case you weren't already happy enough, the latest title update for Happy Wars has arrived. Title update 6 brings a host of new changes to Happy Wars, even more so than previous updates in the past. This update brings new gameplay features and bug fixes, in addition to eight new achievements that are worth a total of 100G. Also, although specifics were not detailed, Microsoft Studios stated that the latest update will also improve the matchmkaing process. It also introduced a new map called Deep Sea. 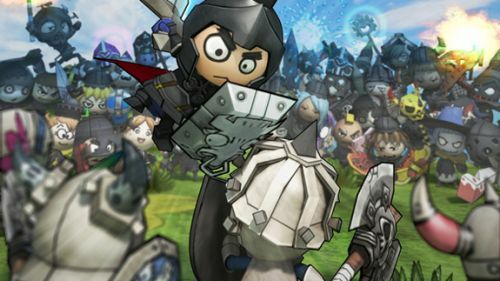 The interesting thing about title update 6 is that it is the second collaboration effort between Happy Wars and another game. The first was a Castle Crashers collaboration that took place last month. Starting last week, and running until June 12th, the Ilomilo Collaboration Campaign will see players compete in another extreme match style. The rules for this new match are the same as normal, but there is a "wildly re-tuned game balance" to spice up the game. The balance changes will be altered each week, with the first week being the "Even-Steven Match" game type. Here, "all players will fight on equal grounds." Players can earn Ilomilo themed equipment from the new campaign, and any player who has unlocked an achievement from Ilomilo will unlock the Ilomilo helm Pro. Also, the Dazzling Armor Set was added to the item shop, which includes the Kinght's Armor, Priest's Robes, and Wild Bunch Costume. Happy Wars is a free-to-play XBLA game that supports up to 15 players online. Title update 6 is now available and will be automatically downloaded as soon as the game is started.